Take a large frying pan or ribbed grill, add a little oil and put over a medium-high heat. Season your chops and put in the pan, cook for 3 minutes on each side then one minute standing on the fat side to crispen it up. Meanwhile, put your cream in a pot, crumble in your stock cube and bring to a simmer, add your peas and your Parmesan. Bring back to a simmer once again and cook for 3-4 minutes till the cream coats the peas. Season and set aside. 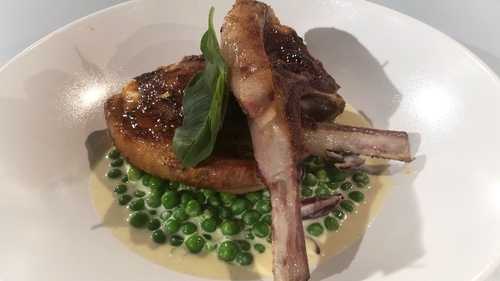 Brush the lamb chops with the mint jelly, then serve with the creamed peas.